The Giant Swing in Bangkok is one of those sights with a fascinating story behind it. You might wonder why it’s called a giant swing – because there really isn’t any swing right now – but there once was. All that is left now is that huge teak arch. Thai people call it Sao Ching Cha. The reason why you can’t swing there anymore – or see anyone swinging – is because there were just too many deadly accidents happening here. Young men used to get on that swing and swing up to 25 meters high. They did so in order to snap a suspended bag of gold with their teeth. This was part of an ancient Brahmin ceremony called Triyampawai in honour of the Hindu god Shiva – they believed that he visited earth every year. It is not clear how they came up with the idea of the giant swing in the first place. Maybe it symbolizes the rising and setting of the sun. But a more intriguing explanation is that Shiva and his consort Uma enjoying swinging in heaven – but that it caused so much damage, they they were not allowed to do so. Because it would start heavy floods on earth. That’s why Shiva then requested, that the swinging must be continued on earth, so that there are good rains for good harvests. However, in the 1930s- during the reign of King Rama VII, all of this was over. It was forbidden, in order to avoid more accidents, about a 150 years after it was constructed on April 8, 1784. 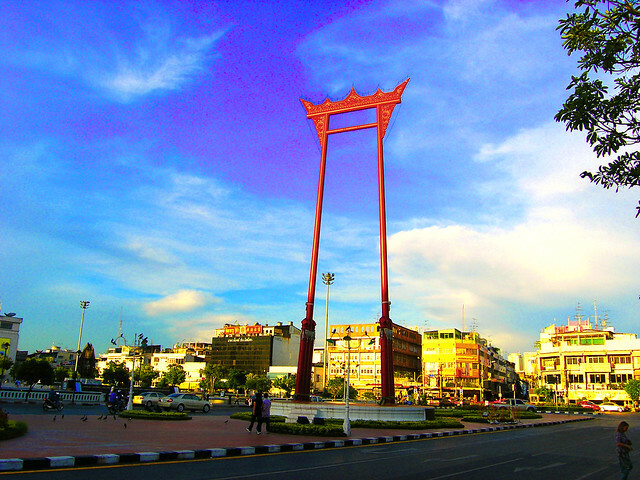 It was King Rama I who ordered the construction of the swing. He was advised by Naliwan Brahmin from Sukhothai province. But this was not the first swing in the kingdom of Thailand – the first one was brought into Thailand by two Brahmin priests to Ayutthaya, the previous capital of Thailand. It was in the reigh of King Ramathibodi II (whose reign lasted from 1491 to 1529) that this first swing was brought into Thailand. This first swing was a present from the king of Belares in India who wanted to make peace with King Ramathibodi II, because he couldn’t defeat him in war.